They came waiving their magic wand. This is the story of another time and place in my life. Unforeseen twists of faith and fortune, maybe by chance encountered or from curious fate, coming out-of-the-blue to turn me upside-down for a while. They came waving their magic wand, or at least that's what it felt like at first. Later I was to realize it was more a double-edged sword. It brought with it material riches, to a degree, a brush with fame, luxury travel, and a price for me to pay in unexpected ways, of course. At home in London, it was the summer of 1982, the phone rang whist I was watching an early evening television soap opera. Simultaneously reflecting on, or rather anguishing about the current perilous state of poverty I found myself in, again, a situation that repeated often in my life before, and after, the events being recalled. The voice on the other end of the phone, from an advertising agency in Tokyo, explained they wanted to invite me to Japan, to take part in an advertising campaign and do some commissioned pieces especially for them. They would pay me a fee for this, and enquired if I was interested. Being unusually aware that maybe this promised some solution to the problems I had been fretting over, coming as it were just before the financial black hole in the ground was about to swallow me, I expressed a positive interest. That evening I went to the I.C.A. cinema in the Mall, with a group of friends to see for the first time ever a double bill of Bombay movies. 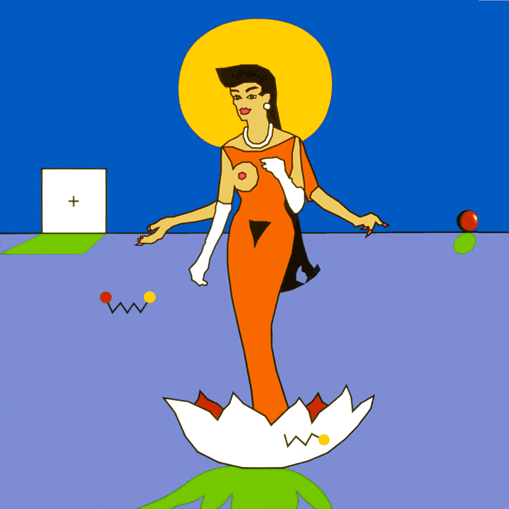 The second film started with an image of Laksmi, the Hindi goddess of good fortune. Coincidentally I had just started on the first of two canvasses that I was to paint of this figure. It seemed a good omen. However, the opening feature had been long and watching the second, somewhat over-excited still from the phone-call, proved too much for my ability to concentrate, and I left about half way through. The friends left behind in the cinema called me at its end. Apparently very soon after I'd gone there was a scene set in a mansion filled with art and there, on its walls, were four of my paintings, or rather copies of them. The title of this movie was 'Pahkesa' (Destiny). The first 'Laksmi' painting, acrylic on canvas, 72"x72", 1982. Stunned, I had to go back the next night to see for myself, sitting through the first part over again, before sure enough there were what appeared to be my paintings, only somewhat distorted. 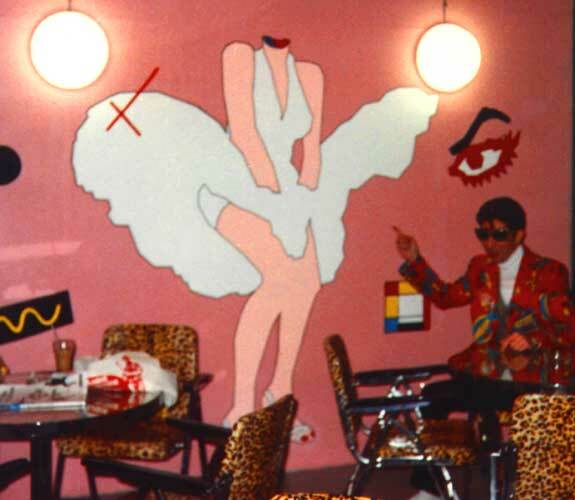 The most likely sources were possibly from magazine photographs of canvasses hanging in my apartment, only the proportions had been ignored in bringing the images onto a flat picture-plane so that they were casually misshapen and deformed, nonetheless easily recognizable as mine. Curious coincidence, I thought, that the film should also start with an image of the idol of fortune I was in the midst of painting, when maybe luck was seeming to come my way at the moment most needed. Perhaps their disturbed perspectives should have offered me some clue that all would not be straightforward. acrylic on canvas, 54"x48", 1977, distorted as in the movie 'Pahkesa'. Having received overtures from Japan before that came to nothing, I awaited impatiently and apprehensively the promised arrival the following week. Earlier proposals from other companies, department stores, museums and galleries there, included a press reception on arrival at the airport, a book, television documentary, and exhibitions in Tokyo and elsewhere across the country. Receiving contracts previously that remained mere concepts, my expectations were somewhat mixed. From the press I had been getting in magazines, from photos that showed copies of my work there, (even when in Los Angeles, someone had shown me one taken in Tokyo of a large billboard made from a painting of mine with the words 'copy' on it and 'We are fan -sic- of this great artist'), I knew there was more than a little interest in what I was doing. At this point though, it was another opening line, another maybe. 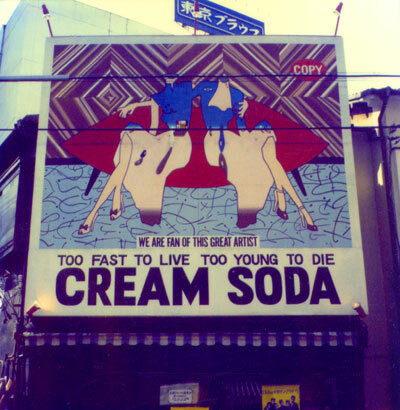 Harajuku billboard, late 1970's - 1980's. Like the one received on the phone, equally unexpected, sitting in the late afternoon Italian sunshine, more than 30 years later at the castle in Tuscany where I was staying, at this moment of writing this account. Someone rang asking if I was free to sign a contract that would give me a guaranteed income for some time to come. My inner reaction as ever was to wonder at the price, not what they would pay me, but what I would have to give, or give up, for it in return. Business and Art having an uneasy relationship, the mixed emotions, the feeling of having been there before flooded back. It wasn't new, just as it wasn't then when the Japanese came calling. The coincidence of the timing of this latest approach, simultaneous with writing this, felt however one of those spine-tingling twists of faith. Or at least it did at the time. Two months later, back in the tuscan castle again, continuing this narrative of far-eastern adventure, that offer turned out another of life's little wind-ups, vanishing in a puff of hot air as unexpectedly as it appeared. It too had come wreathed with promises, including bizarrely a vanity-piquing request, to name a new building after me, sadly now destined not to be. 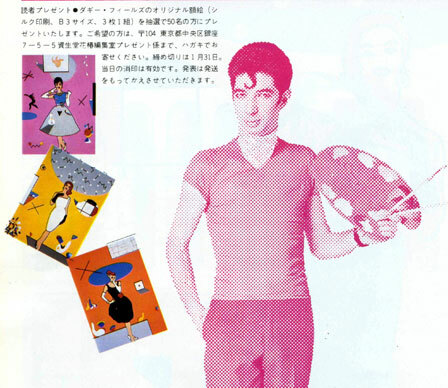 The Japanese behind the 1982 approach were from Shiseido, and for a while I thought the name equated with 'Shazam' or 'Hey Presto'. Such was the allure of what they seemed to be offering, and thus the apparent transformation in my fortune. Indeed from the start of my journey for them, their name literally appeared as if by magic, everywhere. It was before they had started to market their products in England, and although vaguely familiar with the brand, I had little knowledge of the sheer scale and size the business involved, really no idea just what I was letting myself in for. 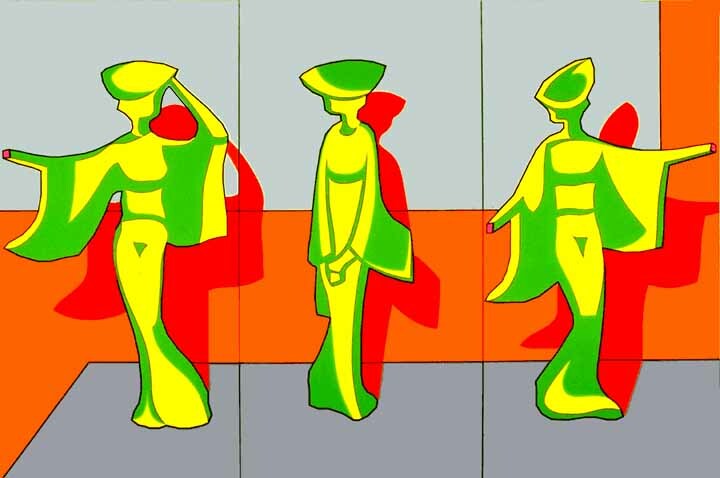 On arriving in London the following week, three Shiseido company representatives presented me with story boards for four distinct television commercials they proposed would feature me and the paintings done specifically for them. There was also to be a female model, who later I found was the focus, with me the added colour. It was a line of young women's cosmetics they would market through this campaign, on television, in magazines and on billboards. Really I couldn't see then or later where I fitted, but they wanted my image and imagery, offering money at a time when it wasn't appearing from other sources. Being not in a situation where I could really afford to say no, even had I wanted to, I was grateful for the opportunity and intrigued at the prospect. Fascinatingly, presenting me sketches of the pictures they wanted to commission, I could see they were quite familiar with my work. Taking disparate elements from different paintings to make these pictures, in a way quite successfully suggesting new images I might make for them. a collage cartoon, made from several sources. However, the timescale allowed for this before the commercials were due to be filmed, wouldn't allow me to produce actual canvasses, or as many as hoped for. It was agreed that I should produce studies only, which would then be turned into large-scale paintings in Japan. The trip itself was to involve a ten-day stay in Tokyo, during which time I would complete the pictures and they would shoot the commercials. It was suggested I could bring an assistant, although they would not pay a separate fee but would provide suitable extra expenses. A journalist who had featured me in several magazines including one owned by Shiseido and who knew of their proposal, on running into me in the street beforehand, advised to accept whatever payment was offered as a fee, and negotiate only over expenses. To do otherwise would, she explained, be considered offensive. Later she was to demand an agent's fee and find my rejection of this also offensive. Shiseido for whom this woman had worked on a free-lance basis apparently decided not to employ her on the project. She felt since she'd been responsible for much of my press in Japan, that she should be involved, and deserved payment, if not from them, then from me. As a journalist, she was not in my employ, receiving money from Shiseido and the other magazines she wrote for. Shiseido had chosen directly to come to me, for them her job was that of reporter not go-between. As I understood it, she was opportunistic now claiming, after I had signed with them, that I should pay her instead. Repeating this behaviour later I heard with both Vivienne Westwood and Malcolm Mclaren, she demanded to become their agent in Japan. This did not happen either, but in Tokyo I was to feel the wrath of her rejection. The difficulties of contracts and negotiations were uppermost in my mind, with the coincidental simultaneous timing of musing over past happenings for this account and the unexpected arrival of that recent proposal. Discussing it straight after, on what was the last outing to Florence of that visit, with Johannes Weidinger my host and patron here, we were remarking during the journey on the apparent synchronicity of events. Arriving in Florence, Johannes parked on the banks of the Arno and we had barely taken a step towards the Ponte Vecchio, when the first person to pass us stopped in amazement and asked if I were me. At first I thought this must be someone, an Italian, I'd met before, but his over-excitement revealed this not the case. He asked for my autograph, in disbelief that he had actually met me, telling me I was a myth. Somewhat flattering and surprising in Italy, but something that took me straight back in memory to Tokyo, where it became a frequent occurrence, back then once the campaign started. That it should happen here, when it did, and in the company I was with, was another unexpected echo. In discussing the contract with Shiseido I was offered a business class ticket to Tokyo. My assistant was to travel in economy. On seeing the proposed schedule, having already asked for the return to be booked via Los Angeles and New York, I suggested, if they really wanted me fit for filming on the day of arrival, they take me first class. This was rejected outright, and I thanked them politely for the agreed stopovers in America. On hearing this they immediately said I could travel first, also my assistant would have a round-the-world business ticket. Pleasantly surprising, my thanking them had been spontaneous and without expectation. Accepting the fee, whilst not a lot for all wanted, nor compared to what someone would be paid for a similar role without producing artworks, did seem to solve some immediate domestic problems. The expenses offered sounding insufficient, on objecting were doubled instantly. At the time, I hadn't realized how cared for we were to be. The only thing we spent on was the hotel telephone. Taken everywhere, we both left with almost all the expense money intact. This was repeated on my second trip for them, when, without an assistant, I received the same fee again, plus the amount for expenses previously allocated the two. Discussion over and dates arranged, completion of the studies had to get done as soon as possible. They were to be sent ahead, and enlarged by artists in Japan. These turned out to be film set-painters, and I was to end with only one day to work on the details. Meanwhile there was the exhibition that I'd been having in London to un-hang. The assistant I had taken on for the project, Martin Brown, was left to take care of this as I commenced on the new pictures. 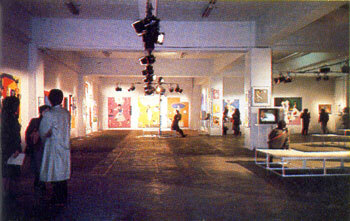 The exhibition was in a warehouse gallery in Wapping, beside the Thames. Whilst the pictures were being lowered out the window by hoist from the fourth floor, my self-portrait fell to the ground. 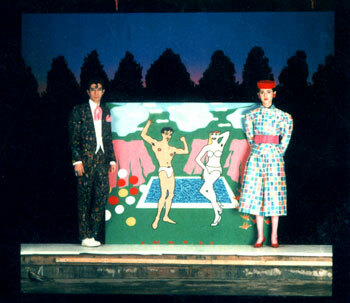 This larger than life painting with the top of my head sliced off, Martin watched fall to earth as if in slow motion. Remarkably it fell straight down, landing flat on its edge, before tumbling over onto the road, with barely a scratch. Perhaps though, I shoud have seen this as an omen of what was to come. 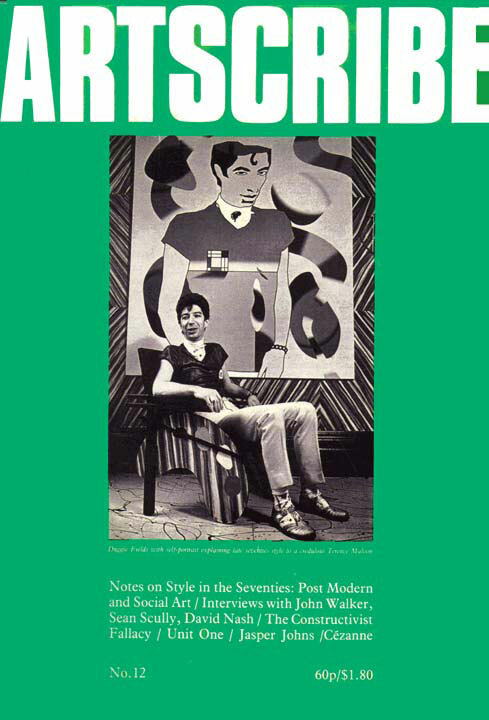 On the cover of Artscribe magazine, U.K. 1980, the self-portrait that fell to earth. Stepping on board the plane into first-class for the first time with the brand new top-of-the-range Walkman given me for the journey, I discovered some degree of the company's ubiquity. The freebies passengers were given and all the toiletries in the loos were branded Shiseido. As if by magic entering another world, I listened for the first time to Lohengrin up in the clouds, for its overture to exactly end at the moment of first touchdown on the journey. The arrival at Tokyo airport had glamour, standing in the immigration queue behind Freddie Mercury. Travelling by limousine into the city, wherever I looked, were buildings with the word Shiseido written large over them, 'Shazam', for sure. The hotel we stayed in, the Imperial, originally designed by Frank Lloyd Wright, I was told was where Ronald Reagan had stayed when President. It had a large, airy, somewhat minimalist reception area. One was bowed to constantly before going through doors, into and out of elevators, even during journeys up and down. Out in the streets, all the doors seemed to open on approach however small the business, just as taxi doors opened automatically, so one was also expected to exit leaving them open to be closed behind by the driver, a curious sensation both of welcome and status. The clause in the contract my attention was specifically drawn to before leaving London, was the one stating I must obey the laws of Japan. This referred to drugs, and it was under-lined that on no account was I to consume any whilst they were responsible for me, i.e. the whole time in Japan. A Paul Mcartney clause, being shortly after his problems there. On the film set the first morning, I received a gift from a stranger, which when opened contained a package of neatly rolled joints. Having been met in the hotel reception by an interpreter as well as by the trio of executives from the company in what was to be a daily routine, and escorted by limo to the shoot, I thought it best to quietly hand them to her for disposal. Had I wanted to smoke them, the sealed windows of the hotel suite and the more-than-attentive staff would not have allowed this, so much for exclusion clauses. My studies had been translated fairly accurately into full-scale blow-ups, though these, before the advent of modern day digital technology, weren't as accurate as I would have liked, somewhat clumsy in detail. The team of painters were still working on them. I was allowed by the schedule only a few hours myself for any alteration, though Martin was able to spend longer. The paintings looked good enough though for a quick glance, and once incorporated into the somewhat complicated setting for each commercial seemed to go down well despite any reservations I might have had. The first set, on which I received the illicit joints, was that of a grand drawing room dominated by one of the four big pictures that in turn occupied its main wall. 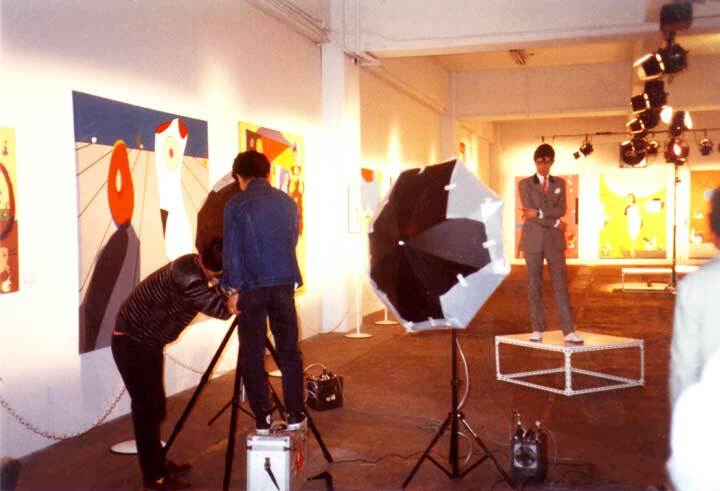 Each featured a single figure in front of whom the model was to appear as if emerging from it, whilst I was placed in the foreground to one side, holding paintbrushes and a painted artist's palette, just as I had portrayed myself in the largest piece, a pose suggested by their original sketches shown me in London. 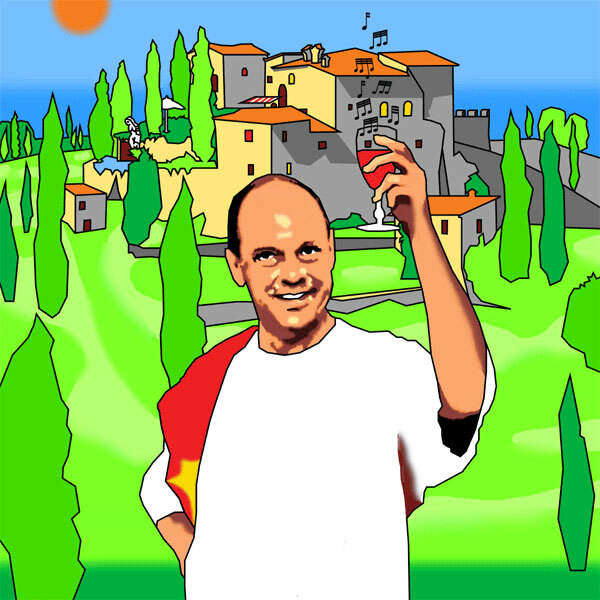 The photo image of me like this would be made into a life-size cut-out and a mini-logo, appearing in promotions around department stores and shops, I was to discover after. With the painted palette and prints. The model, tall, fragile and skinny, I can only describe as a Japanese wasp. Obviously from a 'good' background, loved horses, dressed in her own clothes as if in a Ralph Lauren campaign, but was over-styled for these commercials, in outfits which made me somewhat uncomfortable, bearing little relation to the figures I had painted. It took a while to register, aged 37 I was being made into some kind of pin-up for their teenage range, named of all things 'Perky Jean'. This brand despite Shiseido's usual sophistication was a 'cute' youth line, and I was somehow to be its image, for a season. Shooting the commercial required very little of me other than just stand still and fix the camera with my eyes, whilst the model moved around in a way she would seem to come out of the painting, repeatedly. However I had to be there, alert, attentive and available for whatever. Incomprehensible discussions endlessly went on around me. For lunch on that first day, with car and driver sent for, a private room in a restaurant has been booked, and we set off with my three executive escorts plus, Aimi O, the interpreter. After what in reality was probably not so far, but in Tokyo's ever grid-locked static traffic seemed an endless drive, we arrived to be shown into, of all places, Denny's, a sort of fish-based equivalent of a MacDonald's chain I was familiar with seeing and ignoring in California. Here apparently it had a certain class. Trying not to show disappointment, aware that this had been out of consideration for what was thought would be my taste, I requested for following days to eat the same as the rest of the crew, brought in bento boxes, instead. On the deconstructed set of the first shoot. The first two commercials were filmed on this one set. The remaining two made on location at the old Toho film studios, another seemingly endless drive away, on vast somewhat decrepit sound stages, with an ever-larger crew and more complex sets. One of the studios had a special pool of water incorporated in the design just to send ripples of reflected light across it. The other included several large trees and lighting effects that simulated fireworks going off behind. In both I spent hours standing rigid, only moving to reflect the light from the stone in my ring to the camera lens. The difficulty and embarrassment for me here were the toilets, hole in the ground style, which had also seen better days. In both of these scenarios, I was wearing suits with tight trousers, impossible to squat in at the same time as keep off the somewhat grubby ground. Asking to use a regular toilet required speaking to the interpreter, who then had to consult the director, before car and driver were sent for, so I could be driven to the nearest western-style convenience situated at the furthest end of the studios from where we were shooting. The whole crew, which by now seemed to consist of so many people, had to wait whilst I went, every time. The schedule also included a weekend break in Kyoto, a stay in a ryoken, a traditional style hotel I was informed Sophia Loren had stayed in, and an evening with Maiko, the virgin version of Geisha. When this was proposed my interpreter told me it was politic to accept the invitation, as for the executives who would accompany me, this would be their only opportunity to have such an experience, being so expensive. The Maiko, when they eventually made their entrance after what had been a more-than-prolonged alcohol fuelled build up, quickly lost their sense of decorum however when they sawboth my assistant and me. Wearing a red suit, one of a collection given me in Tokyo by the company behind the billboard 'copy', they instantly identified where it came from - Cream Soda, owners of the Pink Dragon building in Tokyo, a chain of shops across Japan including one nearby in Kyoto, as well as a rock-a-billy band, the Black Cats, who often wore the style I was now in, and whose avid fans these girls were. With my assistant, Martin Brown, and the Maiko, Kyoto. My introduction to this company had been through a close friendship with the half English half Japanese model Vivienne Lynne, at this time one of the most highly successful and beautiful around. Vivienne had been the model for several of my paintings, featured in a super 8 film I'd made the previous year that had been screened at the I.C.A in London, and which was to be shown at the exhibition in Tokyo on video. Maybe she had really been the one through whom my work first got exposure in Japan. Vivienne's friend Yamacham, the owner of Cream Soda, had been the earliest to buy my work from out there. Indeed it was a painting he bought that had become, without my knowledge, the billboard 'copy'. His company made many multiple pastiches of my work, adorning items from murals, to ties and trashcans, all without my knowing or permission. He was to make only the occasional new purchase of a design after. With Vivienne Lynne for ZDF T.V. Germany, 'Menschens Kinder', 1984. At that time Vivienne, making her own records in Japan, also featured on a billboard above his Kyoto shop, and had become the Maiko's 'Madonna'. This unexpected connection to their heroine had them in a fever of excitement, convulsed into school-girlish giggles close to hysteria, instantly destroying the atmosphere of expectation that had been built before their arrival. 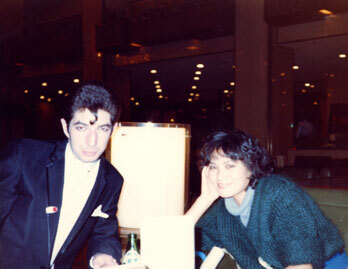 With Vivienne and the Black-Cats, Tokyo 1983. A chance encounter in a recording studio, when I came to meet her and found myself dressed to match them. Shiseido had also proposed as a second project they should hold an exhibition of my paintings at the same time as the launch of the ad campaign. In principal this had been agreed but with many details remaining to be ironed out. They offered me the same deal as for the commercials, only this time to come without an assistant. They had seen my exhibition in the Wapping warehouse in London and wanted to re-create this 'ambience' in Tokyo. They also wanted to re-make my living room as an installation, an idea that at the time felt an intrusion too far. When I objected to the warehouse concept, thinking it over-funky and inevitably ill-equipped to deal with handling somewhat fragile canvasses as had been my London experience, they explained to me that all the large exhibition spaces in Tokyo were in department stores, and since they do business with all, they couldn't favour any one with this project. It was their only option. The work would also not be offered for sale, selling art was not their business. Having been approached previously by the top gallery there, I arranged a meeting with all, to see if some joint effort were possible. However the gallery refused to have any connection with the Shiseido event, and informed me if I went ahead they would never touch me again. Since Shiseido were to pay me a fee for showing with them, I asked if the gallery could offer any kind of guarantee that would make it possible for me to refuse, but they could not. Later in New York, discussing this with Andy Warhol I was to discover they owed him money he was anxious he was not going to receive. Andy had not then yet been approached to make commercials there, was keen to do so, and rather impressed that I had. The warehouse space was reluctantly agreed on my part, with stipulations that it should be painted white and adequately heated as the show was to be in winter, dirt and cold not the best environments for acrylic canvasses that mark easily, prone to crack with extreme temperature changes. The fee offered was more than I made at some exhibitions where work was offered for sale, only this time I would get everything returned. 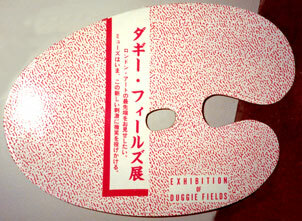 It was to be, including the 'paintings' produced in Japan, my largest exhibition to date. Another offer I couldn't refuse. Apart from the bizarreness of how art-direction of the commercials appeared to me (I was allowed no creative input other than offering choice of clothes to wear for shoots), all seemed to go quite well. The paintings in them may not have passed detailed examination, but they fulfilled their purpose, only destined for a short existence being made with un-fixed pigments, at a scale larger than I could accommodate in my studio in London, making storage a problem. At the close of the exhibition I assume they were dumped, as I was to be after the campaign. Towards the visit's end I was summoned to a meeting with the rejected journalist and Shiseido executives. She was demanding involvement in the exhibition arrangements. They still did not consider her necessary to the project, nor did I. However I was to receive the full fury of her anger when she let rip with a verbal assault including racist taunts that left me feeling shocked. Humiliated I couldn't conceal my obvious distress at this public attack. It was the last I was to see of her, Shiseido never mentioning her or the meeting again. A few years later on enquiring as to how she was, I was told "she millionairess now". Leaving Tokyo after this first adventure, before going home I headed happily for Los Angeles and New York. The reality of what had actually happened to me, and was about to come next, wasn't really to sink in until my second venture there. 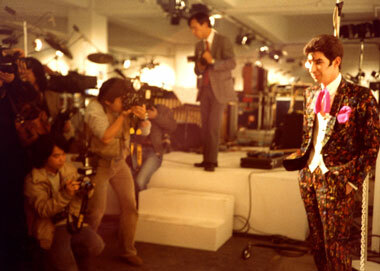 Returning for both exhibition and launch of the ad campaign, life was to become more surreal. It was an experience that took me some time to recover from. Back in England there was much organising to get the collection of work together for transport to Japan. There was little time between the pictures being sent off and my following. Arriving late February in Tokyo again, back in the Imperial Hotel, it was the same morning ritual, met by the group and interpreter before being whisked off. This time however there was no time for sight seeing outings as on the first trip. All was organised appointments from early morning on, mostly interviews for magazines, T.V. and radio, and photo shoots. First though was the exhibition itself to see to. Arriving at the space two days before the opening I was horrified at the sight that greeted me. The warehouse was in the docklands district, at that time a run-down seedy area, only just starting to have an outside brush with gentrification. A side of Tokyo I hadn't seen before, in the damp and cold, very un-appealing. The warehouse, with exhibition announcements. Inside, the raw space was still just that, a floor in a working building, far from the clean, white, warm space I had stipulated in the agreement. The paintings themselves were still in the crates sent over in, some in the process of being unpacked. Two days before the exhibition was to start. By the next day there had been slow progress. The space was whiter, though the floor not so clean as I would have liked. The paintings now out of their cases, were ready for being installed where they might hang. This usually takes some time to figure out. Simultaneously lighting was being put in, but no sign of heat. With this going on, I was walking around with a smile fixed on my face as we shot from one interview to the next. Photo sessions took place anywhere. The interviewers all seemed to ask the same questions, so that before the end of the week I told my interpreter to just get on with it without me. Aimi, the interpreter, had heard all the questions before, and my answers. It seemed pointless and exhausting repeating myself continuously. I just sat there with this babble going on around me, clueless in fact as to what it was all about, but smiling and nodding my head at what felt appropriate intervals. The day of the opening did not start well. An early morning visit to the exhibition revealed chaos. 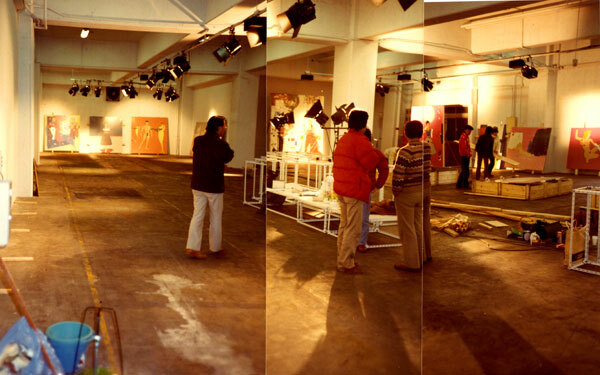 Certainly most of the pictures were hung and lighting, supplied from film-sets, ran on huge tracks around the space. 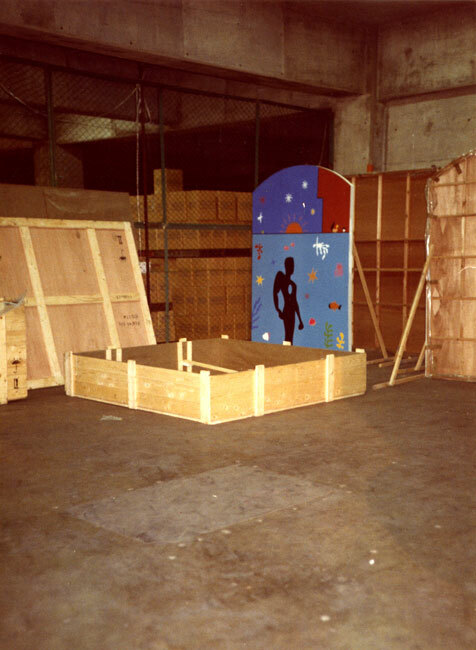 Still no sign of heat, I discovered not one but two separate sound stages being built in the space. Questioning this, I was informed there were two bands giving performances at the opening. Both these stages were in the process of having their own amplifiers, speakers, and lighting systems installed by people who seemed oblivious to the fact that most of this was going up directly in front of the paintings, making it impossible to see them without some kind of obstruction. Palette signs appeared over the warehouse, inside and out. Equally upsetting was the prominent display of 'Perky Jean' products arrayed right in the entrance to the space. In making the agreement to have the show with them, I had expressly stipulated that although I would be happy to have the Shiseido logo used wherever necessary, I did not want to have the product brand associated with the exhibition in anyway whatsoever. It was bad enough, I thought, having paid to fly the paintings all the way from London they were then planning to turn the lights out on them for part of the opening. Bad enough the space, far from pristine, was freezing. Feeling Perky'd out, before leaving for another smiley-faced interview I called for a meeting on my return. Getting back with only a couple of hours to go before the opening, I was ushered into a room with a large u-shaped table at whose top end I sat with my interpreter, the only woman present, around it, twenty or so men in suits. Aimi O had been with me from day one of the first visit, and we'd had an instant rapport. An attractive half-Chinese, brought up next to a US naval base, she spoke perfect American. During interviews I had complete confidence in her ability to relay what I was trying to express. With my interpreter, Aimi O, in the lobby of the Imperial Hotel. This was the only time however I wasn't sure. My voice got more and more out of control, as hers stayed calm, until I found myself saying angrily I didn't think she was conveying to them just how furious I was. At the moment of almost losing it, in frustration and exhaustion, I registered all these implacably calm faces looking back at me were wearing badges declaring, 'We love Duggie'. By the end of the meeting though the point about the 'Perky Jean' display had been noted. Afterwards one of them walked up and just pushed it so the whole neatly arranged counter with piles of product crashed to the ground, spilling lipsticks, eye-shadows and powders all over, to the shocked looks on the faces around, before every trace was removed. Or so I thought. Temporary heaters appeared before evening, speakers and lights were hastily re-organised, whilst I hurried frazzled back to the hotel to collect the hand-painted suit they requested I wear for the event, and get back in time to change into it there. 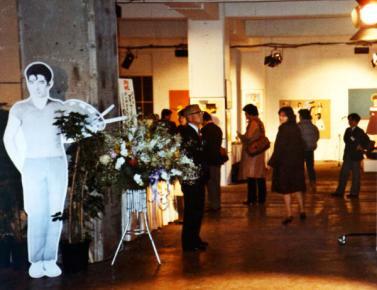 Exhibition entrance, Tokyo 1982, with cut-out, and Aimi O, looking back out. The evening itself was another sort of ordeal. Having never actually enjoyed an opening of my own, uppermost in my mind that I hadn't spent all this time and energy on making party wallpaper. Usually more aware of who haven't come rather than who has, that anyway none of it is going to change my life. This one however was in a league of it's own. Using make-up on my eyebrows, I add points to them daily as part of the ritual of self composition, just as I exercise, shave each day, usually apply a small amount of powder to eliminate blemishes and shine, once done something I pay scant regard to. Whilst feeling completely normal, I am aware it causes mixed reactions in those looking at me. For this event, the make-up girl was constantly rushing over throughout to powder down shine that built up as did the heat, the space going from freezing with the effect of both the suddenly appeared space-heaters and the enormous volume of people that flooded in. Trapped by the cameras, back against the wall, I remained isolated in their focus. What started by feeling novel and flattering attention, seemed to continue endlessly until I literally felt drained, relentlessly held in the glare of their lights, and had to signal Aimi get help to extricate me. Later this was somewhat repeated when I had to appear on one of the two stages along with the President of Shiseido and various others involved in the exhibition and commercials, to be presented to the crowd, with speeches which naturally I understood nothing of standing sheepishly by. 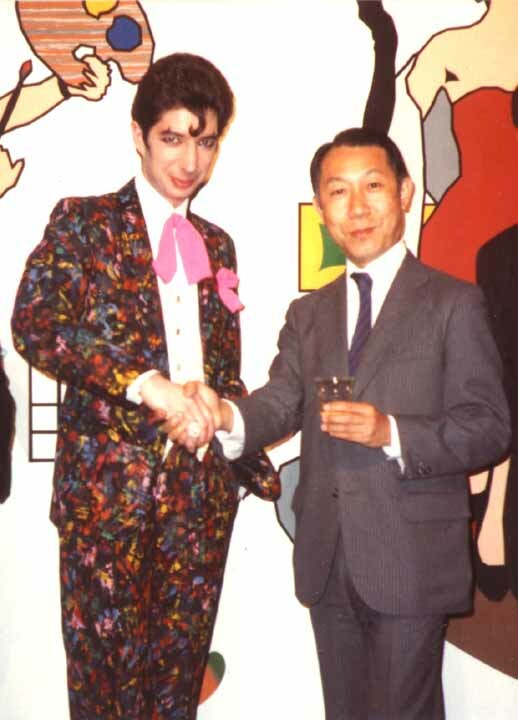 With Mr Fukuhara, the Shiseido president. The evening progressed indeed with the lights on the paintings turned out for the first of the musical performances on the stages. For those arriving then it was as at a concert, excepting the first was a Japanese hard-rock band who were there because their music was featured in the commercials, certainly not as a representation of my musical taste. The second act was a curious group of colourful girls fronted by the lovely Chica Sato, who I'd met in the late 1970s when she was in the band the Plastics, one of the few familiar faces there that evening. Someone I was very happy to see appear, without knowing what to expect. With Chica Sato and her girls. Chica indeed looked stunning, having moved from her punk days, wearing a suit made entirely out of cork, as were all her accessories, memorably aping Chanel couture long before its contemporary revival. Along with her were only a few other familiars in what was a vast throng of people, most of whom it seemed wanted me to sign the prints that had been made, unknown to me, as take away gifts. These were three beautifully produced silk-screens taken from my studies for works in the commercials, presented in a specially made folder with the palette cut-out figure adorning its cover, along with Shiseido logo. Only there were 800 of each print. Once someone had thought to ask me to sign them, a long queue formed with more pleading requests for me to do the same, so that I spent the remainder of the evening scrawling my signature whilst constantly having to stop, smile and be photographed at the same time. My delight on seeing these prints was soon reduced discovering the packets nonetheless still managed to contain 'Perky Jean' lipstick samples. Signing them, and I think I signed all, also meant I didn't get to eat any of the food I could see being ferried around everywhere but in my direction. By the end of the evening I was exhausted, drained and starved. Wanting respite, I refused the offer of drinks with the team, and slipped away with Aimi. Remembering someone had mentioned they might go to a particular restaurant, we decided to join them. However we arrived at a very chic spot to discover neither of us even had the taxi fare there, let alone anything to pay for food with. Embarrassingly we had to announce this to a large group of complete strangers, the familiar faces having already left. A memorable opening, certainly. The next day back to the usual early morning start with interviews, photos etc, I found myself on the national T.V. news having to explain why I had chosen to bring my works to Japan and show them in a warehouse. When, before the interview itself, I tried to explain to the interviewer that it was not my idea and certainly not my choice, she only replied that she would ask why it was. This resulted in my reluctantly waffling on about warehouses, telling of Soho in New York, as well of developments in L.A and London, being the coming areas for contemporary art spaces. 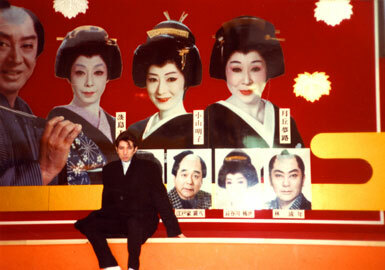 Apparently I was the first 'international' artist to show like this Japan. Later that day, I was to meet the owner of the building and he thanked me profusely for choosing it. 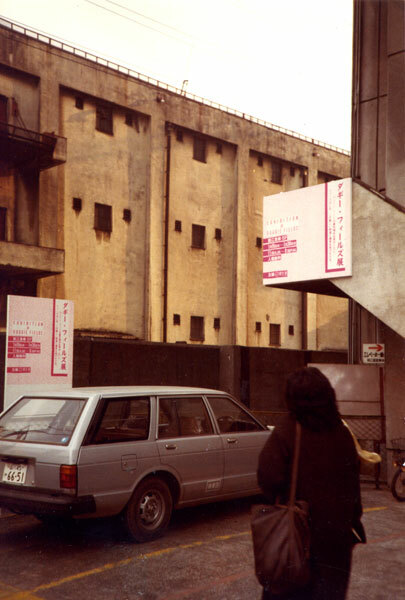 When I returned to Tokyo the following year I was told how much media attention the district had after the exhibition, and how as a result the property values there had soared. We made nationwide television news the next day, at the same time as the commercials started being aired, and they seemed to be on continuously throughout the remainder of my visit. 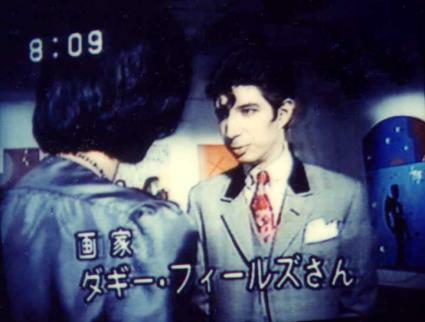 Figuring out all the costs of the exhibition, Shiseido probably still 'bought' this television time for far less than they had to pay to air, let alone make, the commercials. They got their product placement, the kudos of culture and a news-story, all in one go. Indeed I had been presented by them as a 'culture special', something the company did now and then. Around the time of my show, they had another, a presentation of Abel Gance's silent film 'Napoleon' complete with symphony orchestra. Not sure how I fitted with that, but certainly we featured together on their joint flyer. Waffling about warehouses, on the national news. With the start of the campaign came the start of reaction. Arriving back in the hotel, suddenly the lift-girls' calm was replaced by shock and excitement. It seemed whenever I stepped out of my room, wherever I went it caused consternation. Out in the street people would stop and stare, mouth-open in amazement, come up with requests for autographs or to have their picture taken with me, even literally jump up and down with speechless excitement. On going into a store, voices all over started screaming, and embarrassed I beat a hasty retreat. Entering an elevator, squealed at all the way up, trapped. In a nightclub, girls started kissing and pulling me so I had to be aggressive to get out of their clutches, and again had to leave. 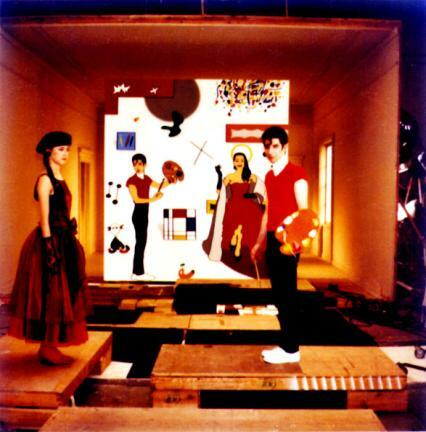 Walking on my own down the street, I started seeing myself everywhere in see-through plastic prints on windows and doors. Feeling fragile and unable to cope with the constant attention, I fled back to my hotel room. This was to last a few years so that anywhere I was, someone Japanese would spot me and react with excitement. 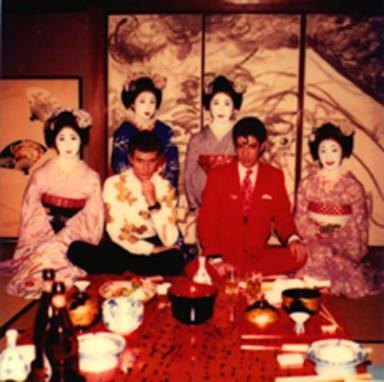 It happened on return visits to Tokyo, at the airport In L.A., regularly back in London. Even in the hall of mirrors at the Palais de Versailles, on my first visit I upstaged the surroundings. Then slowly it vanished, such the fleeting fashion of fame and contemporary celebrity, becoming only an infrequent occurrence after. Signing autographs in the street, just a few hours before I collapsed. The second Japanese trip ended however with something of a dramatic climax. Due to make my journey back via Bombay, for a first ever visit to India, my last day in Tokyo was a Sunday. A day free of commitments to Shiseido I spent with some of the few friends made there. However in the afternoon after lunch, I started feeling somewhat unwell and dizzy, making it back to the hotel in time to erupt simultaneously and viciously from both ends. Spending a delirious ghastly night on the bathroom floor, I staggered to the hotel doctor in the morning. Barely having any language in common, he held me horrified at arms length as he injected and sent me off with packages of pills. Bombay cancelled, I was shipped back to London, given a bed on the plane that I was scarcely in a state to appreciate, and arrived home somehow in a dreadful state of high fever. Feeling dizzy on the way back to the hotel that last day. This worsened, so that by the end of a bed-ridden week of night sweats I had lost a stone in weight. My doctor didn't know what to make of my condition. One minute I was complaining my stomach was in agony, next chest or back, but all the time I was feverish, getting thinner and weaker. All sorts of tests were undertaken, as I progressively got worse. This was a period in Britain when Aids was first making an impact in the media. Lying in bed watching a documentary on television I couldn't help but register some of my symptoms being discussed in that context. Not expecting a positive reaction, I did however request to be tested, something that took more than two weeks to get results from at the time, and I lay in bed in a miasma of pain awaiting them. Getting worse all the time, I could by now barely spend anytime standing upright. Even reaching a point of fear that had me calling someone in the middle of the night to come sleep on the floor next to me, so much had my difficulty in breathing become, worried I might not wake. It felt a brush with death, one of those times you are forced to confront your own existence, in doubt and very physical distress. The test results when they came revealed that wasn't the cause of my illness. It took more than a month before I was diagnosed with brucellosis, a cattle disease rarely passed to humans, usually contracted through un-pasteurised milk products. I had eaten pasta with a cream sauce that last lunch in Tokyo. All in all, I was bed-ridden in fever for three months, it took another three slowly recuperating before I recovered and was back on my feet again. Perhaps this was suffering for art, or perhaps from commerce, whatever, an all-together unforgettable experience. I returned to Tokyo twice in the following two years. Once on my own, and a year later with my friend the designer Zandra Rhodes, after we had travelled to Australia via Los Angeles and Hong Kong, separating in Japan, to meet up again in New York. Without the entourage and driver, Tokyo seemed more accessible, easier to find where things were relatively,frequently closer on foot than they seemed by car. Still I got the street attention, the amazed looks, and discovered still more pastiche paintings. Through it all though, perhaps I had already been consumed and my day there was over. Having heard from my more sophisticated Japanese friends that I should never have done the project, that it was too 'mainstream', and would destroy my 'avant-garde' credibility. It seemed maybe they were right. That I had let them turn me temporarily into some kind of 'Pop' icon took me away from the arena of the 'serious' I had apparently previously occupied. There was to be no follow up exhibit from Shiseido, nor any other source, a mere trickle of media only after, the fickleness of fortune coming with its price. In life I always think the big trick is learning when to say no. Sometimes though, to be in the position to say no, is itself a privilege. When they came knocking, I answered with relief. Perhaps I should have armed myself beforehand with more knowledge, certainly maybe a tighter control of how I would allow myself to be used, but through all I have little regret. It enabled me to continue at a point that was uncertain, and, surely, I learnt from the experience. It feels somehow a certain ironic destiny at work. As a child brought up living above my parents chemist shop in a little English village at the end of the railway track, itself in the midst of a post-war army base, I was to play in our conservatory amongst the discarded display items from the shop's cosmetic department, some of the most vivid and colourful iconography of my childhood. 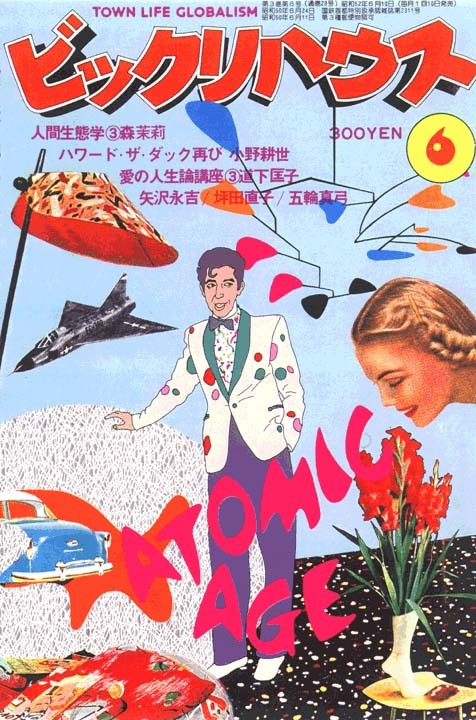 Born on the day the atomic bomb was dropped on Hiroshima, I was more than half a lifetime later, to become in that land part of this same commercial iconography myself, and likewise, discarded. 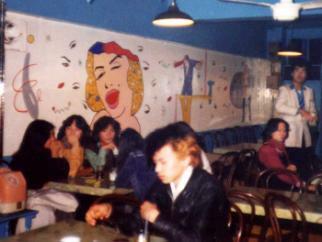 'Thinking japanese', acrylic on canvas, 80"x120", 1983. Idea from bronze statuettes I staggered back with to find in souvenir shops here.